Open since 1938, once owned by Raging Bull boxer Jake “The Bronx Bull” LaMotta and still owned by his family, Krug’s Tavern in Newark’s Ironbound neighborhood is housed in an unassuming and dilapidated building that could be mistaken for a run of the gin mill bar full of cranky old men drinking piss-yellow beer out of tiny glasses. Inside, it has that kind of feel. A few high top tables, a long mahogany bar with patched red vinyl stools. 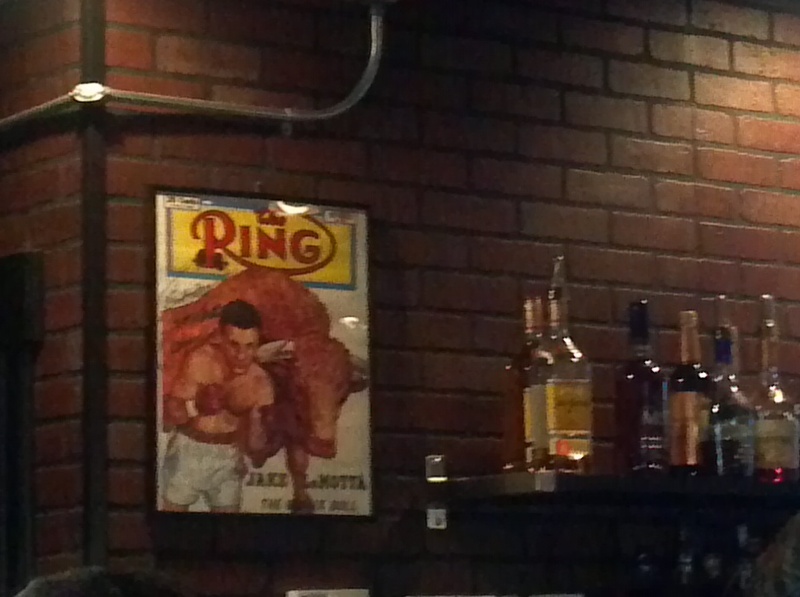 A poster of LaMotta behind the bar, amidst the bottles of Tullamore Dew. But if you venture in the flimsy storm door and linger, you’ll find an energetic blue collar crowd stuffing the place at lunch hour, from electrical workers and hard hats in uniform, the boys from the docks in their tracksuits, and cop brass stretching their conservatively cut sport coats. The kind of place where crook and law alike will belly up to the bar. Behind which sits a glass case brimming with meatballs the size of grapefruit, which will soon become a legendary burger for those with king size appetites. Order one and they’ll flatten out that softball of fat speckled chuck on the griddle and sizzle it low and slow so it remains juicy even if you order it well done. When I was a kid, there was a diner car named Nunzio’s, run by an eponymous, mustachioed fellow who could’ve jumped in a pair of overalls and white gloves to play Super Mario. 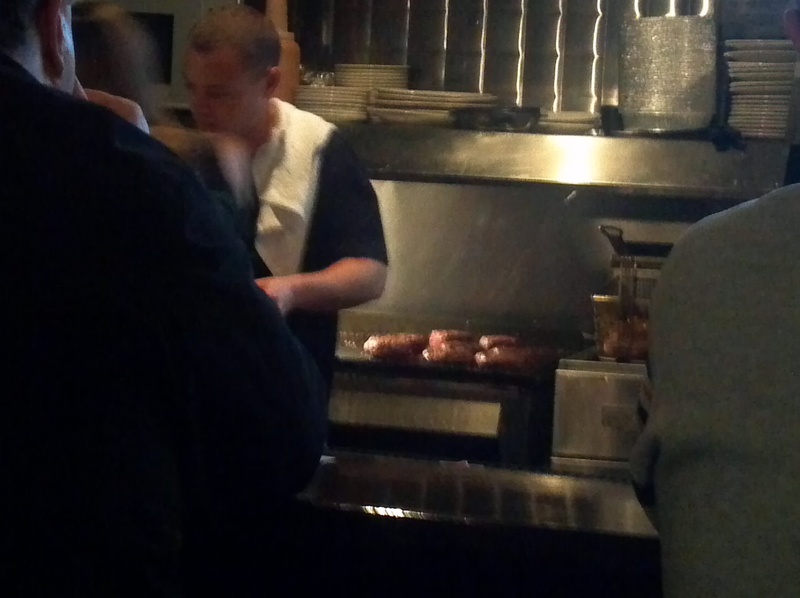 He served a juicy burger on a Kaiser roll that remains the paragon of burgers to me. He wouldn’t serve me one on Friday during Lent, either. I had to get peppers and eggs on a roll. Krug’s burger hits that nostalgic memory in the bullseye. They serve theirs on a large sesame seed bun that is just barely up to the task. It stays together, but you eat your burger wondering if you’ll have to finish with a knife and fork, especially if you’re generous with the ketchup. 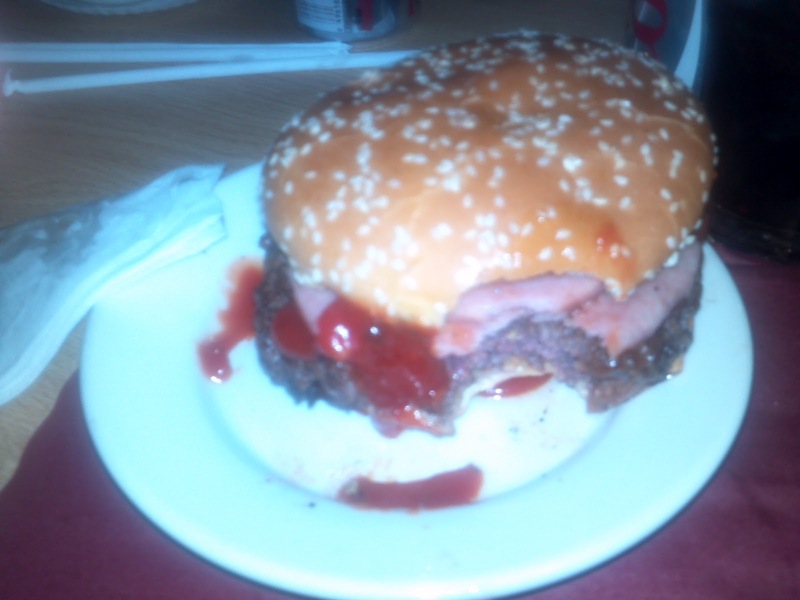 Places that manage a juicy griddle burger are uncommon these days. Ann’s Snack Bar in Atlanta makes an even bigger patty than Krug’s, their infamous Ghetto Burger- a full pound of well-seasoned beef topped with chili and cheese, the size of the paper plate it’s served on- and Jimmy’s in Harlem steams theirs under a steel ice cream cup. 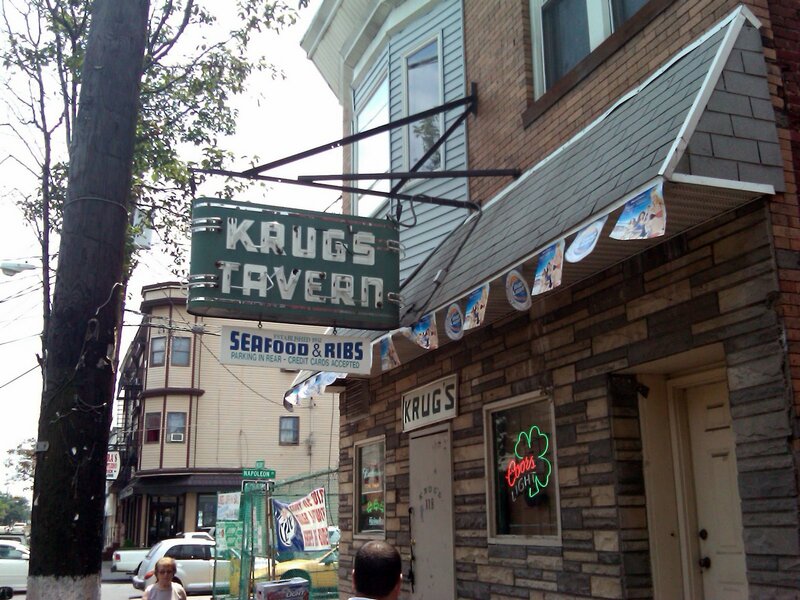 Both are worth visiting, but if you’re in New Jersey, only Krug’s will do. Oh, I love the burgers at the Cloverleaf Tavern. If you get them medium rare, those perfect chewy rolls handle any number of toppings, from their Cajun Crunch burger topped with house-made spicy potato chips, to the Fatburger with Monterey Jack cheese sticks and Taylor Ham pork roll. But Krug’s is all about the beef. 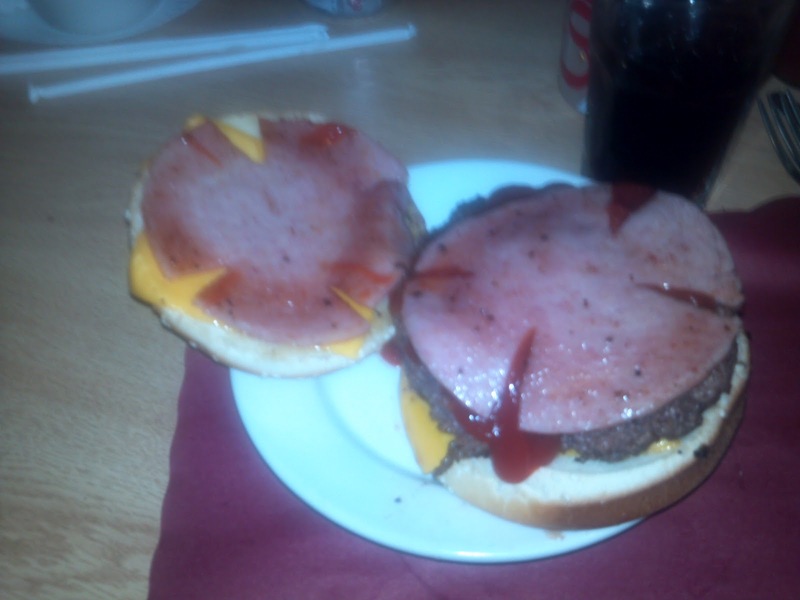 I’ve had bacon cheese burgers at Krug’s, and most recently, a Taylor Ham & cheese (pictured above). It is that rare burger that is not overwhelmed by a crisp and smoky slice of bacon, or two slices of fat and spicy pork roll. All you taste is good, juicy, ground beef. What a burger should be. They pack 3/4 of a pound into that bun for $6.50. Bacon or Taylor is a buck extra. Fries and battered onion rings- both excellent, crispy and always fried in fresh, tasteless oil- are extra. And enormous. Their mozzarella sticks are house made, never frozen, fried to bursting, crisp and gooey as they are meant to be. They have a good selection on tap, with Harpoon and Sam Adams available as well as the American trinity of Bud-Miller-Coors. 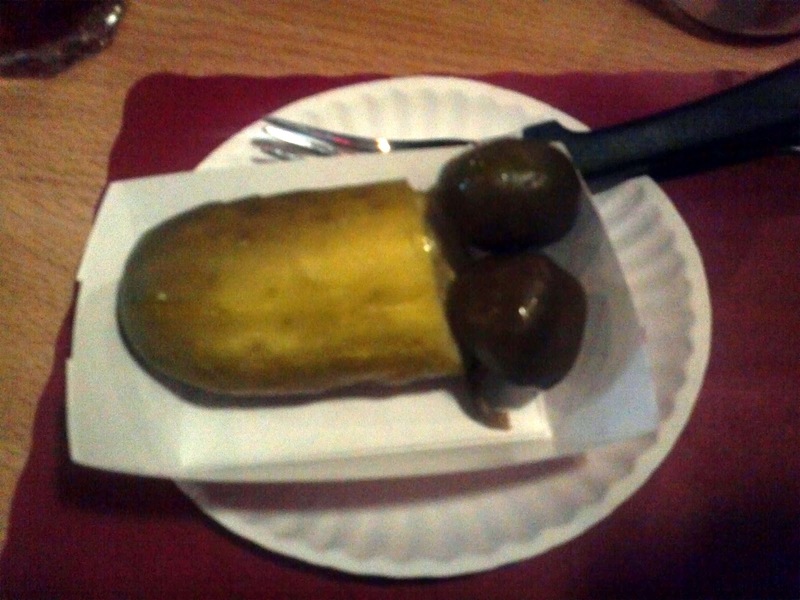 They serve Cokes in the can, and your meal begins with a fresh sour pickle and two hot cherry vinegar peppers arranged in vulgar fashion. I’ve written about Krug’s before for Serious Eats, and it is always a memorable experience. They are consistent, and I’ve never had a bad burger. Doing it since 1938 must help. The place ain’t pretty, but it’s got character. There’s a biscuit shaped elbow of pipe jutting through the tiles in the men’s room. A ’58 Thunderbird rusts on flat tires in the parking lot. Loud men lunch here, venting out the day’s woes. But it’s an original, and without pretense. My kind of place. Next, I’ll give you the rundown on my favorite seafood joint- not Legal Seafood, despite their excellent food- but a little hole in the wall in Garfield where a bowl of fried clams and a beer won’t set you back more than six bucks. ← Glen Cook’s Garrett P.I.